Motorised awnings operate at touch of a button, allowing you to extending and retract your awning from a switch inside the house, or from the comfort of your chair using a hand-held remote control unit. 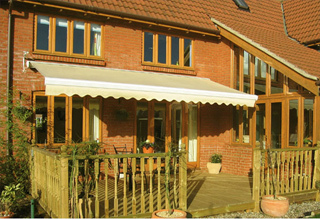 When retracted our motorised awnings look both neat and compact. We offer controls made by Somfy, a company with a well-earned reputation for reliability to ensure that our awnings will provide many years of trouble free service. The Somfy motor gently powers your awning, ensuring that it closes correctly in its cassette. Independent environmental sensors working off sunlight or wind speed can be added to communicate with the motorised awning and automatically extend and retract your awning even when you're not there. This will ensure your furnishing, fabrics and carpet are protected from fading. And should there be dangerously high wind conditions, your motorised awning will automatically retract. Just one remote control for everything on your patio or in your garden and its shock and water resistant too. So you can extend your living room to the patio with one click.